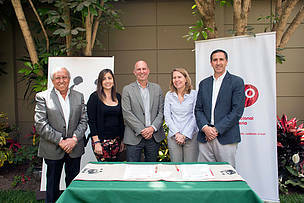 Lima, December 7th, 2018.- Peru’s National Fisheries Society (SNP in Spanish) and WWF Peru, signed a cooperation agreement today, in order to continue working to safeguard the biodiversity of the Peruvian sea and increasingly improve the management of critical fisheries. The renewal of this alliance will allow the fruitful cooperation between the two organizations to continue, which, since 2014, has aimed to promote the sustainable use of hydrobiological resources to encourage responsible fishing. SNP’s president, Elena Conterno, indicated that this agreement has promoted transparency and dialogue in key spaces of the sector, such as the Forum for Sustainable Fisheries and Aquaculture, which brings together the main public, private and academic actors. "Thanks to this important agreement with WWF Peru we have also been able to train the crew members of companies associated with the SNP in the correct release of sea turtles caught incidentally," he noted. In this regard, WWF Peru's country representative, Kurt Holle, said that this important effort adds to the work of his institution to investigate, monitor and avoid the incidental capture of protected species such as sea turtles and dolphins. "It is key to continue generating discussion spaces on fisheries regulations that allow improvement in the management of the activity. It is also crucial to replicate these dialogue spaces in other sectors relevant to the environment. For WWF Peru, it is essential to promote coordination between authorities, fishermen, companies and civil society to achieve a greater commitment among the actors," said Holle. According to the document signed today, both institutions are committed to collaborate in research and capacity building for the conservation of marine biodiversity and the management of marine ecosystems, and, to establish spaces for the analysis of studies and proposals that contribute to the improvement of the fishing sector. 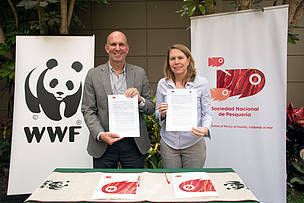 The agreement signed between the National Fisheries Society and WWF Peru has a term of validity of three years.